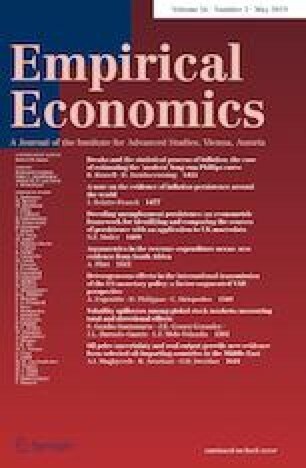 This paper provides an empirical evidence on the influence of oil price uncertainty on the real economic activity in Jordan and Turkey during the period 1986:01–2014:12. To measure the effect of uncertainty, the paper combines a bivariate structural VAR with a GARCH-in-mean process that allows oil volatility to affect the growth of industrial production. Our results indicate that oil market uncertainty has a negative influence on the industrial output of Jordan and Turkey. For instance, the increase in one standard error of oil price uncertainty is found to be associated with a decline of 0.81 and 1.01% in the industrial production of Jordan and Turkey, respectively. Moreover, consistent with the recent empirical evidence, we find that output growth increases/decreases after a negative/positive oil price shock. These results imply that sound energy policies that mitigate the effect of oil market uncertainty may help in stabilizing output in both countries. The authors would like to thank the editor and two anonymous referees of Empirical Economics for their valuable and helpful comments. The authors are responsible for any remaining errors.